Steven (Chicagoland, United States) on 17 January 2012 in Landscape & Rural and Portfolio. 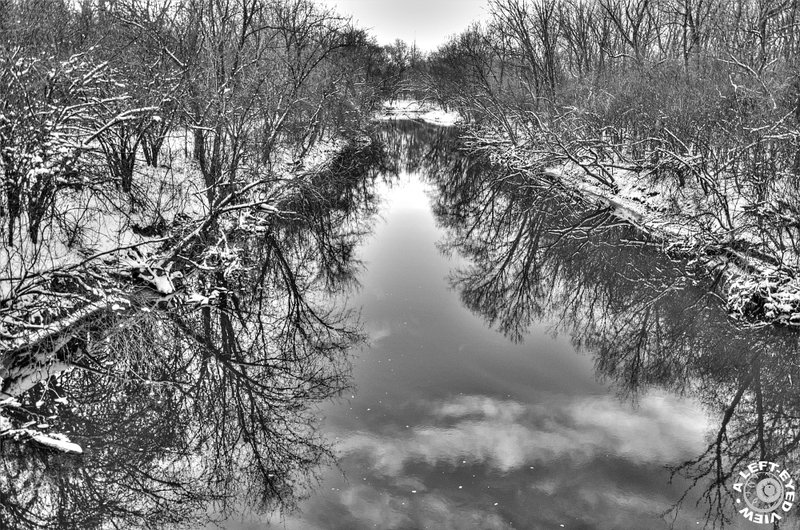 View of Salt Creek the day after the season's first major snowfall, as seen from the bridge along Kemman Avenue in LaGrange Park, Illinois. Photo captured January 14, 2012. That looks great in black and white. Such depth to the scene. i like the symetric in this compo and the bw processing is very appealing! winter is the perfect season for capturing bw motives, cause the contrast are fantastic and perfect for it! superb! A beautiful photo ! reflections are fantastic ! Gorgeous shot! Beautiful perspective and tone! Stunning point of view, Steven. Perfect framing to create this vista with its crisp reflections and lovely tones. That water looks definitely like a wonderful miorror! Beautiful detail and sharpness (as always) in this gorgeous B&W, Steven! The last time we had any snow of any decent amount was in the middle of October, for heaven's sake! Since then - NADA! I heard Curly refer to their weather over there as an extended Autumn...I think he is absolutlely right - we are getting the same deal here in PA/NJ and parts of New York State...I love this one, Steven - great piece! Wonderful composition , so baeutiful reflections . Wonderful B&W with really great reflections. I love the reflection in the water and the snow on the trees! A beautiful composition! Wow, this is absolutely gorgeous, Steven!! I just love the clouds reflecting in the water. Well seen and shot! in the water, reflections of a fantasy, stardust we know as snow appears everywhere. This is such a classy shot. Well done. A superb, clean, wintry-good shot. gorgeous ... the symmetry and the tonality are superb here, as are the details and the processing! A wintry scene indeed. I like the reflected cloud. Very pleasant shot due to its ambiance, symetry and reflections.